Spheroidal Bavenite crystals with polycrystalline growths on their faces. 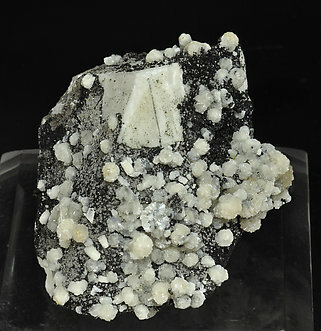 They are very bright, have an ivory white color and are implanted on a Microcline matrix with small chlorite coatings, slightly smoky Quartz crystals, and, notably, small clear and very bright Chabazite crystals. The sample is from the Carlos González Bargueño collection, whose label we’ll send to the buyer. Carlos was the first to find these Bavenites and it was thanks to his labor that these extraordinary samples have been saved. 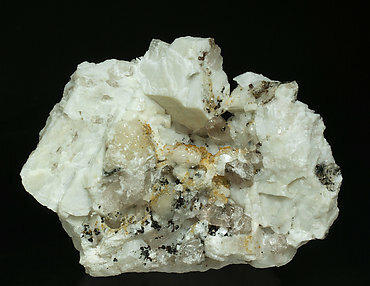 Group of very well defined divergent sharp Bavenite crystals, very bright and on matrix, with Albite and Quartz crystals. The sample is from the Carlos González Bargueño collection, whose label we’ll send to the buyer. Carlos was the first to find these Bavenites and it was thanks to his labor that these extraordinary samples have been saved. Spheroidal aggregates of divergent sharp Bavenite crystals. They are very bright and are on a well crystallized Microcline matrix partially coated by very dark green chlorite. The sample is from the Carlos González Bargueño collection, whose label we’ll send to the buyer. Carlos was the first to find these Bavenites and it was thanks to his labor that these extraordinary samples have been saved. 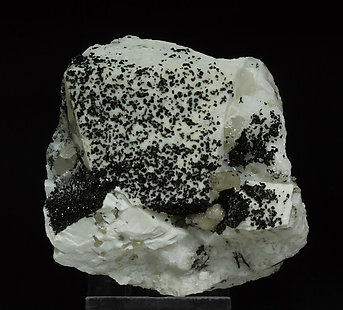 Group of spheroidal crystals of Bavenite with sharp polycrystalline growths. They are very bright and are on a Microcline matrix with chlorite coatings. The sample is from the Carlos González Bargueño collection, whose label we’ll send to the buyer. Carlos was the first to find these Bavenites and it was thanks to his labor that these extraordinary samples have been saved. 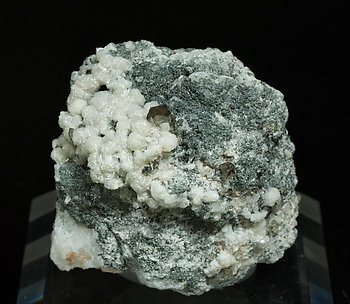 Aggregates of spheroidal Bavenite crystals with an ivory-white color and implanted on a Microcline matrix with small Quartz crystals and aggregates of Chlorite micro-crystals. Spheroidal crystal of Bavenite with very sharp polycrystalline growths on its faces. 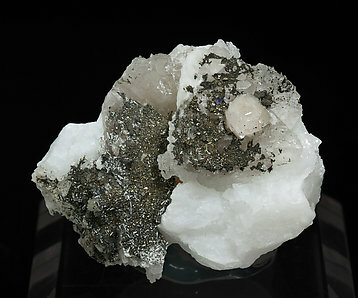 It is very bright and is implanted on a Quartz matrix partially coated by Pyrite and chlorite and with a curiously added small crystal of purple Fluorite. The sample is from the Carlos González Bargueño collection, whose label we’ll send to the buyer. Carlos was the first to find these Bavenites and it was thanks to his labor that these extraordinary samples have been saved. Spheroidal aggregates of platy Bavenite crystals. 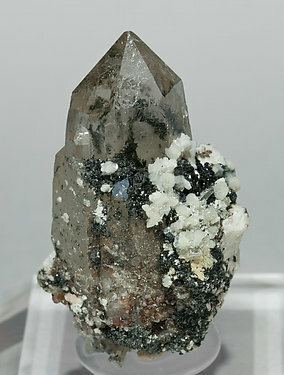 They are translucent, very bright, and on matrix, with Chlorite and small, very clear and bright, smoky Quartz crystals. Carlos González Bargueño was the first to find these Bavenites and it is thanks to his labor that these extraordinary samples have been saved. 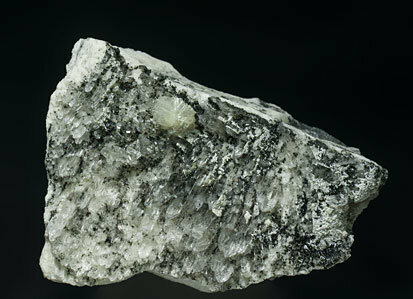 Isolated Bavenite crystal with polycrystalline growths on its faces. 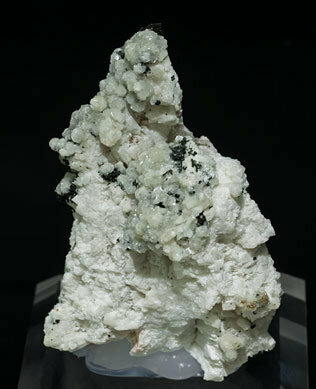 It has a good luster, with an ivory-white color and is implanted on a Feldspar matrix coated by epitaxial Quartz crystals, with scattered Chlorite crystals. Spheroidal aggregates and platy Bavenite crystals. 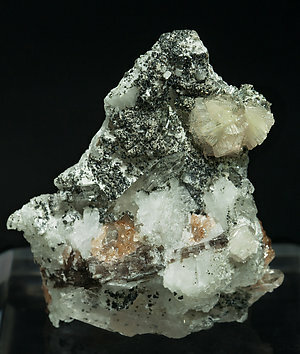 They are very bright and are on a matrix with smoky Quarz, partially coated by Chlorite, also present as inclusions in the Quartz, and with small garnet crystals. Carlos González Bargueño was the first to find these Bavenites and it is thanks to his labor that these extraordinary samples have been saved.